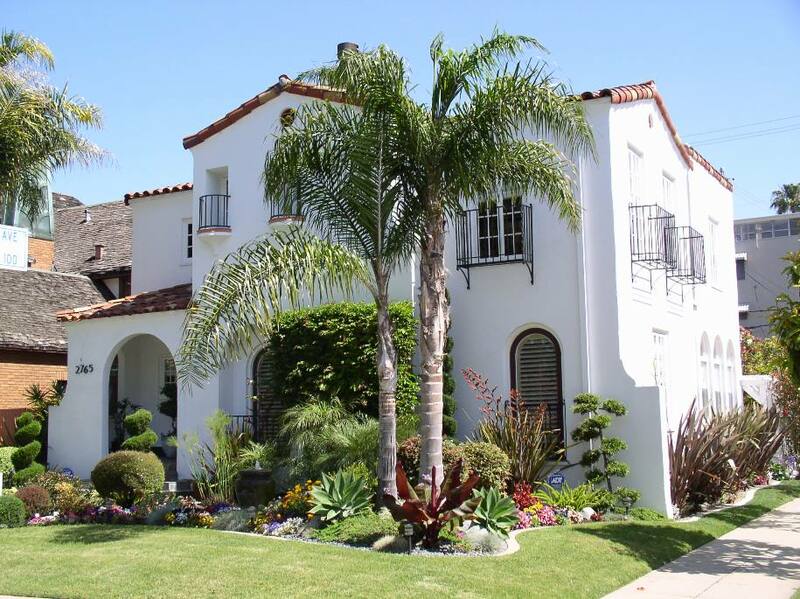 Southern California, demonstrating the typical features of the style: unframed, round-arch windows, stucco wall cladding, tile roof with no overhanging eaves, decorative tile ornament, and asymmetrical floor plan. INTRODUCTION TO REVIVAL STYLES: Each revival style identifies specifically with an architecture of an earlier time and place, especially those related to early American or European precedents. Several popular revival styles are included on this blog, though other, less popular revival styles also appeared. To classify this grouping of architectural styles presents a challenge, as one could argue that many earlier Victorian styles were similarly revivalist. In fact, one publication includes several revival styles within the larger category of Victorian architecture (Cunliffe, et. al. 2010). The concept of “period styles” has also been adopted by some writers (including this one), though it was an early 20th century term used by non-professionals to romanticize the past. On the flip side are the architectural historians who prefer the more academic “Age of eclecticism” or “Eclectic Era,” which is an important concept to provide historical context here. The Eclectic Era, however, includes both revival and early modern styles that competed ideologically and appeared nearly simultaneously before the Great Depression. For purposes here, then, “revival styles” seems most appropriate, adapted widely across America for use in middle-class homes, wealthy country houses, commercial buildings, early skyscrapers, and civic buildings. Though overlapping with the more picturesque Victorian era, these styles largely gained popularity during the first two decades of the 20th century and heavily influenced our residential and commercial landscapes. During this time (mostly between 1900 and 1929), accuracy of styles became important once again, unlike Queen Anne style, which borrowed from a variety of sources. Most Important, revival styles look to the past for inspiration. 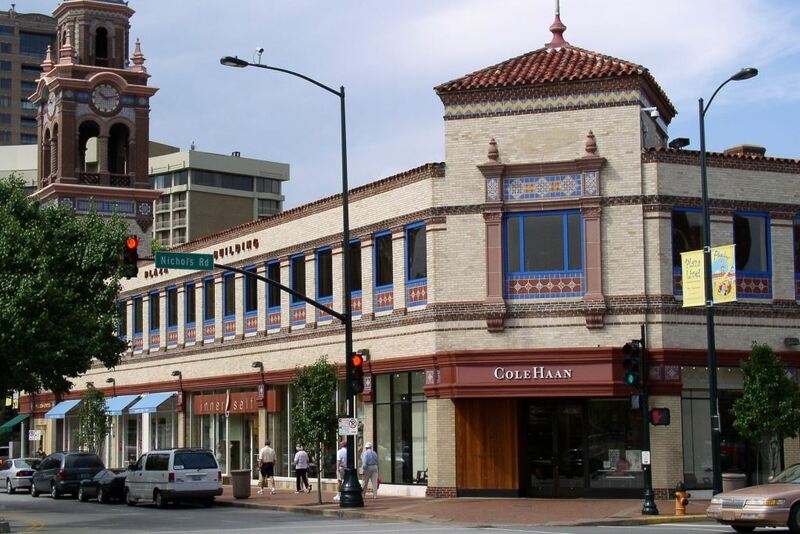 The trend toward revivalist architecture gained momentum from the 1893 Chicago World’s Fair, the Columbian Exposition, where historical interpretations of European styles were encouraged. Simultaneous to the rise of revivalist architecture, the modern era saw its beginnings with architects who were instead looking to the future, not to the past, with more progressive, modernist styles. Thus defines the Eclectic Movement of the early 20th century, which consisted of a simultaneous and perhaps competing interest in both modern and historic architectural traditions. This variety, or eclecticism, provided for one of the most diverse and colorful periods for architecture and urban design in American history, when almost anyone with at least a middle-class income could choose from one of a dozen or more styles for their home. HISTORICAL BACKGROUND AND FEATURES: Spanish revival (also referred to as Spanish eclectic) was inspired by the architecture of Spain and Latin America, emphasizing their rich stylistic details. Due to the early influence of New Spain in the Southwest and Southeast, the style is rare outside the Southwest, Texas and Florida. Typical features include a low-pitched roof with little or no eave overhang, a red-tiled roof, perhaps a prominent rounded arch over a door, window or porch, a stucco wall surface, and usually an asymmetrical façade. 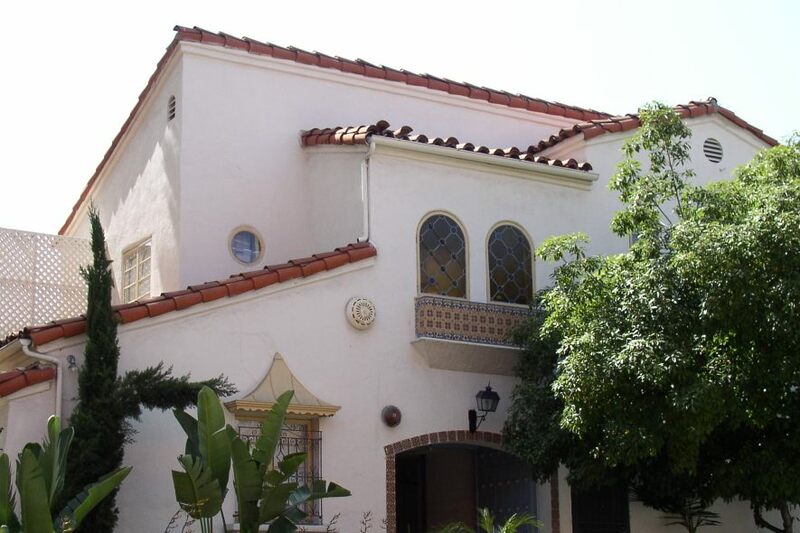 For More Photos of Spanish Revival on Flickr, Click Here. Beverly Hills, CA. This example includes a round, medieval-type tower and a projecting, second-story porch, along with the more typical stucco cladding and tile roof. Flagstaff, AZ. c.1926. 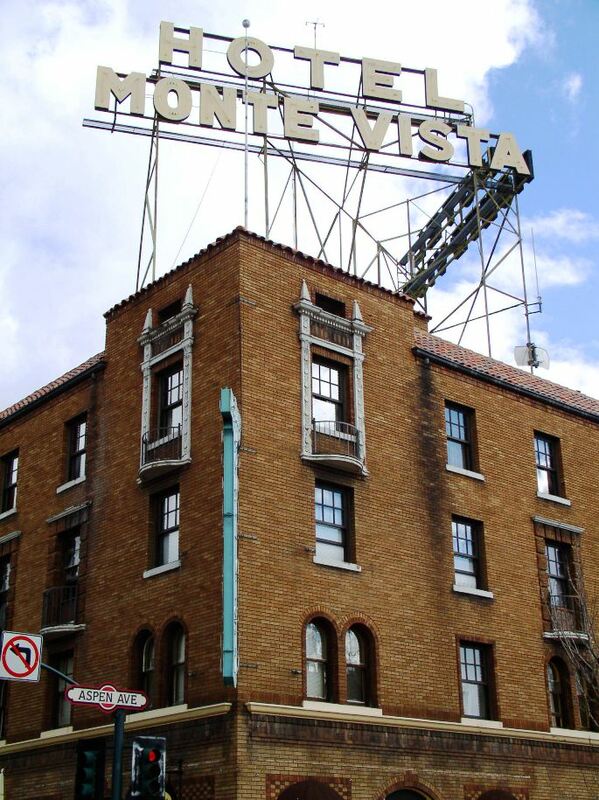 Monte Vista Hotel. A rare Spanish Revival commercial building in northern Arizona. 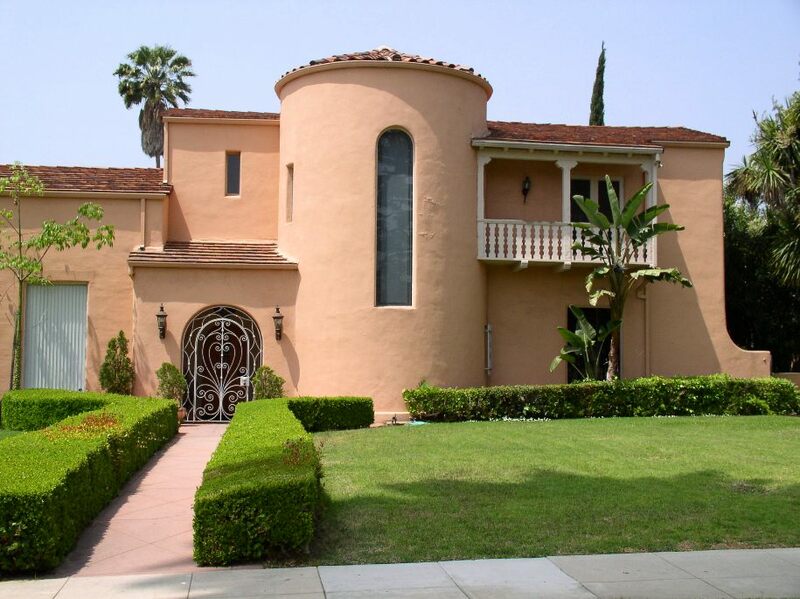 Includes Baroque window frames, tile roof with no overhang, and unframed, double-arched windows. Kansas City, MO. c.1922, Country Club Plaza, America's first shopping center designed for the automobile. The entire complex was inspired architecturally by Seville, Spain. Los Angeles, CA. El Pueblo historic district. Plaza Methodist Church, c.1925. 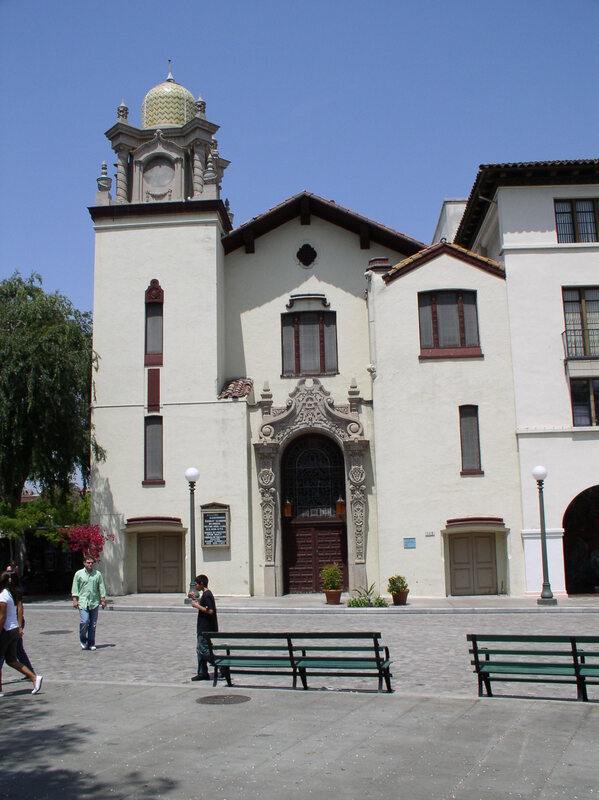 Example of the Churrigueresque style, related to Spanish Baroque. Long Beach, CA. An excellent residential example of the style, with low-pitched roof, no overhanging eaves, occasional round-arched openings, tile roof, stucco surface, and asymmetrical facade.